The season of giving is just around the corner, and it is never to early to start planning your gift list. Jackson & Perkins is here to make your gift-giving as simple and stress free as possible. Your green-thumbed friend doesn’t have to be difficult to buy for, as we have a wonderful selection of gifts ranging from living gifts, garden art, tools, and so much more! 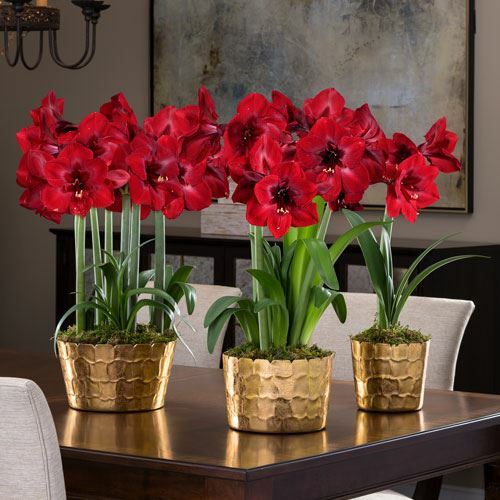 Amaryllis is THE classic holiday plant! These tropical blooms are beautiful and easy to care for, so they are perfect for even the gardener who is just beginning in the hobby. Our fast-blooming amaryllis bulbs arrive quickly and will bloom in just a few weeks. They simply need sunlight and adequate water. Ranging in shades from red to white, there is sure to be a bloom to suit anyone’s taste. 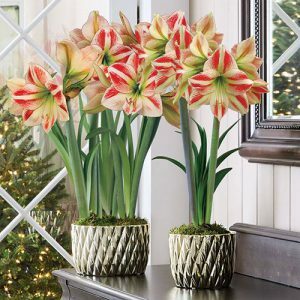 The Christmas Love Amaryllis offers candy striped blooms in a glamorous cachepot. 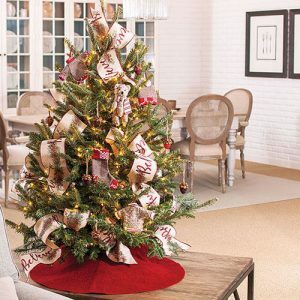 Tabletop Christmas Trees are a wonderful way to add holiday cheer to small spaces. Our fresh evergreen trees bring the crisp fragrance of Christmas into anyone’s home – without having to leave the house. Each of our trees comes ready to decorate, so gather the family around and create lasting memories this holiday season! This season the Believe in Christmas Tree, which is the largest live tree ever offered, will be available as a show-stopping gift! Our selection of top quality bulb gardens make a wonderful gift for any plant-lover this Christmas! Filled with color and cheer, these bulb gardens arrive in a dormant state and bloom just in time for Santa’s arrival. 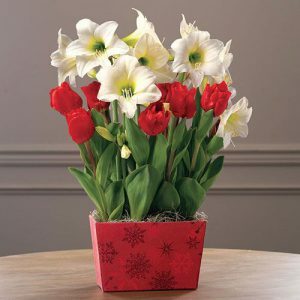 The Winters Bliss Bulb Garden is planted in a festive snowflake container and features beautiful white amaryllis and red tulips. Any gardener enjoys spending time in nature, and often enjoys the company of feathered friends. Birds need a yummy feast as fall fades into winter. Give a unique gift this holiday with any of our fun and creative birdseed ornaments. These feeders are a great way to add holiday décor to the landscape in a fun way. 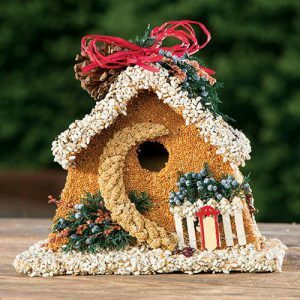 From the Winter Bird Chalet to the Birdseed Ball Ornaments, these are sure to attract and satisfy any winged creature in the landscape. We’re taking the stress out of the holiday season, visit our website to start planning your holiday gift list today!